Tender | Spicy Analytics Kft. 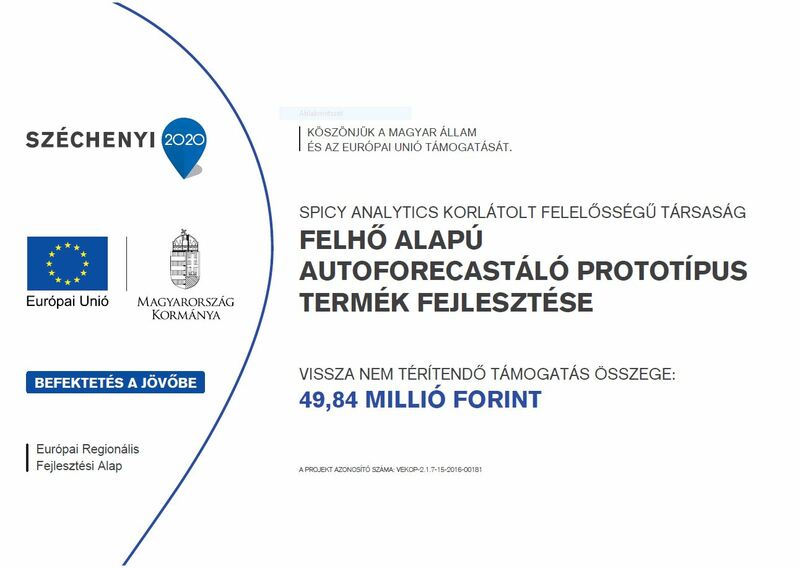 Beneficiary name: Spicy Analytics Kft. The project was co-financed by the European Regional Development Fund. Date of actual completion of the project: 31.05.2019. Forecasts based on traffic data, irrespective of the sector and product, are an important strategic issue for all businesses involved in trade and manufacturing. Accurate forecasting affects every aspect of corporate management: financial management, production planning, inventory management, and marketing. The purpose of the development is to create a publicly available cloud-based autoforecast prototype product that can estimate the future traffic of a product after specifying traffic data sets and individual parameters. For the user, the product is accessible on the web interface, safe, the prepared forecast is accurate, easy to interpret. Our concept is to provide forecasts with the appropriate level of built-in mathematical / statistical algorithms, but without the need for human intelligence. The product is primarily considered to be important for manufacturers / dealers and can be used to forecast standard consumer goods (food, medicine, fuel, electricity, natural gas, cash, etc.). The product will include a model based on several statistical / mathematical methodologies. On the basis of each of the data sets uploaded, the product itself chooses the most applicable (most accurate result) methodology and will prepare the forecast. Two product variants are planned: in the first stage prototype product (demo) the prediction is completely automatic, while in the second stage prototype (full) certain parameters can be set for users with more sophisticated needs and manual intervention.